Option 1: Company directed by the owner. You, the beneficial owner, can be appointed as the Director of Your Business Company. At Your wish this appointment may be directly logged on public file in the Registrar of Companies - or may not be registered, if You so desire. The Registrar of Director(s) will also be held by us, the Registered Agent in the Registered Address of the Company. Obviously, the particulars of the Company Director will also show up in some of the main documents of the Company. Option 2: Company directed by an appointed Director (nominee). In this case the directorship of the company is taken by a professional Director. This position is also commonly known as "Nominee Director" or "Third-party Director". The Directorship service can usually be provided by the Agent (us), as we are appropriately licensed, approved and supervised by our Regulator (the Financial Services Commission) to carry out such service. Certainly, the owner of the company may just as well requre anyone else to be appointed as the Company Director. This can be any person whom the owner trusts. If the beneficial owner of the Company also acts as Director, there are two clear advantages: [A] the company annual maintenance costs are lower, and [B] the company structure remains simple and easy-to-understand. However, there are also several disadvantages. The owner, who acts as the Director of his offshore company, could face local tax consequences in his country of residence/domicile. In many high-tax countries a foreign (offshore) company may be required to register for tax purposes if it is "managed and controlled" within that country, regardless of the fact that the company itself is already incorporated in its own jurisdiction. The "place of management and control" is usually determined for tax purposes as the place where the Directors reside. One important reason behind having an offshore company will often be confidentiality. The owner of an offshore IBC may often be reluctant to show the world his real controlling position over the particular offshore company. There may be several reasons for this, including matters of personal taxation, protection of assets against litigation, deals between the offshore company and the owners' domestic business or government or, as said above, a general aim of maintaining reasonable secrecy. If these considerations are important, Company Management (Nominee) services should be taken. More often than not an offshore company may only remain legally tax-free if it is properly managed by a third-party Company Manager. An outside Company Manager (Nominee) would effectively shield the beneficial owner of the offshore company from most public scrutiny and an obvious direct relation to the given company. One of the main objectives of a having a third-party Company Manager is to prevent the general public from actually knowing that a direct beneficial relationship exists between the client and his offshore company. The third-party Director may perform various administrative functions which would otherwise would have to be performed by somebody directly related to the company. The actual involvement of the nominee Director in the day-to-day matters of the offshore company may vary, in accordance with the necessities, wishes and circumstances of the client. On a basic level, the appointed third-party Director is not actively involved into the regular business matters of the offshore company - he merely fills the position. This is most accurately described by the somewhat out-of-date notion of "Nominee Director". In such case, the client (the beneficial owner of the company) would personally transact, sign and execute the daily business of the company. For that purpose, he may be appointed as "representative" or "agent" of his own company, by means of a special Resolution or a Power of Attorney. In this scenario, the owner himself would in his own hand sign all contracts, invoices, business correspondence, as if he were the chief executive officer of the company. However note that when directorship services are provided by BVI local, licensed and regulated service provider (us), we are to sign as either joint signatory or sole signatory on all of the Company’s bank accounts, and copies of any agreements signed by the attorney in fact will be required for our files. In certain business situations such configuration could be acceptable, although, obviously, the active management by the owner himself greatly reduces his level of confidentiality. However, this active personal management may lead to undesirable questions about the management and control of the company being vested not in the Director, but rather in the "agent" or "representative" (that is, the owner himself), which in turn may cause adverse personal tax consequences for the owner personally. Therefore, a more substantial involvement of the third-party Director would usually be advised. The Director would become part of the company day-to-day business - as it should be in all "regular" companies. In particular, the Director would sign contracts, invoices, deeds, resolutions and any other business documentation, as and when required by the beneficial owner. The third-party Director may also be called to execute control over the bank account of the offshore company. Obviously, the Director would act only following clear instructions by the owners of the company, insofar as such instructions remain legitimate and are clearly understandable. This relationship between the Director and the client would be set in a framework of a strictly predetermined system of communication and reporting. A comprehensive Company Management option largely resolves the problem with the location of the management and control of the company. Only by utilising a proper third-party company management solution, the beneficial owner of the company may remain protected from potential damage by the undesired discovery of his direct link to the offshore company. Fidelity Corporate Services Ltd is licensed to provide company management services in the British Virgin Islands. Similarly as in case with the company director, being a direct shareholder of an offshore company may adversely affect the desired level of confidentiality. In order to conceal his direct relationship with the offshore company, the client may involve services of a Nominee Shareholder. As it is a fairly passive position (unlike the one of the Company Manager), the nominee shareholding service may be provided in a fairly straightforward manner. At the time of registration the BVI Business Company will always have one "Incorporator" - an initial shareholder for a minimum amount of shares. The service of Incorporator is provided by the Registered Agent (us). Thereafter, the shares in the Business Company may be issued and transferred to any further shareholders according to the wishes of the beneficial owner. Alternatively, the shares may remain registered onto the initial Incorporator, who would in this way continue to act as Nominee Shareholder. A Nominee Shareholder may hold shares for several beneficial owners at once. The de-facto relationship between a Nominee Shareholder and the actual owner of the offshore company would normally be confirmed by appropriate declarations of trust, whereby the owner would at any moment in time be able to ultimately confirm his ownership of the company. The BVI Business Companies Act 2004 also provides for a possiblity to configure a Business Company with shares issued to a bearer. While, in itself, bearer shares have usually represented the ultimate way of ensuring the anonymity of the owners of an offshore company, at this time and age this method is severely limited by the law. In particular, substantially higher Government duties apply to IBCs configured with bearer shares, and, in addition, the bearer shares are actually not permitted to be issued into the hands of their real owners. Instead, the bearer shares must be deposited with a licensed and regulated custodian, preferably in the BVI, together with written indications as to the identities of the actual owners of the shares. While these new legal provisions do not completely eradicate the potential application of bearer shares, they certainly make this option less apealing and substantially more costly than utilising the service of nominee shareholder. 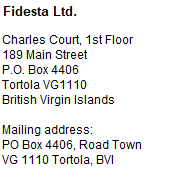 Fidelity Corporate Services Ltd are licensed to provide nominee shareholder services in the British Virgin Islands. These services can be ordered in a straightforward way when ordering Your BVI Business Company.